If you have a high water bill or hear water running in your home in Keene, give us a call we can help you determine if maybe you have a slab leak. We have the best slab leak locating equipment in Keene TX. Slab leaks can be caused by electrolysis, dents in the pipes when they were installed and lightning. If you know you have a slab leak and need slab leak detection in Keene TX, we have the experience to find the leak. Once we have found the leak we can give you an estimate to make the repairs which may be covered by your insurance. Many slab leaks are covered under your insurance. 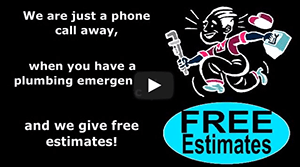 If you live in Keene TX, call for a free estimate and more information on insurance coverage. Please call us for details. Let us help you with your Keene Slab Leak Repairs today! If you have questions or need additional help, please don't hesitate to give us a call. Our expert plumbers are experienced in all types of slab leak repairs. Mailing List For Discount Coupons, News Articles and Annul Reminders and Tips to winterize your plumbing.